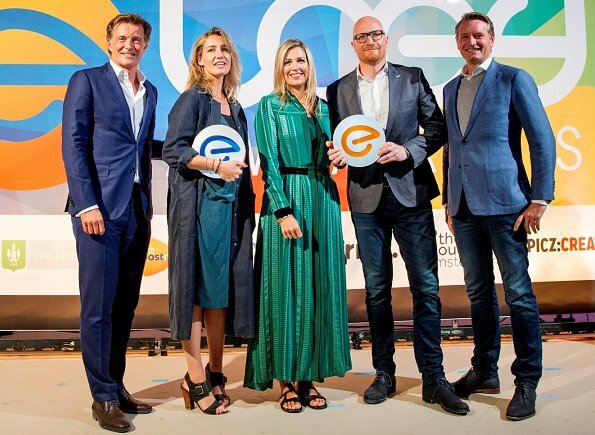 On September 11, 2017, As member of the Dutch Committee on Entrepreneurship and Finance, Queen Maxima of The Netherlands attended the presentation ceremony of the Loey Award for best online entrepreneur held at the Cloud building in Amsterdam, Netherlands. 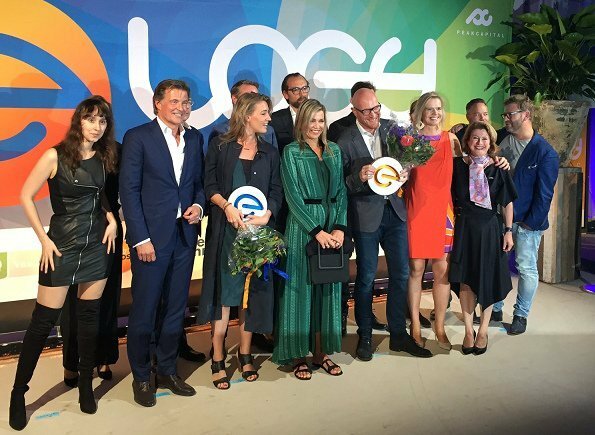 Queen Maxima wore a silk-blend jacquard maxi dress by Zeus+Dione. It looks like she just woke up and is wearing a robe. Definitely not a good look. 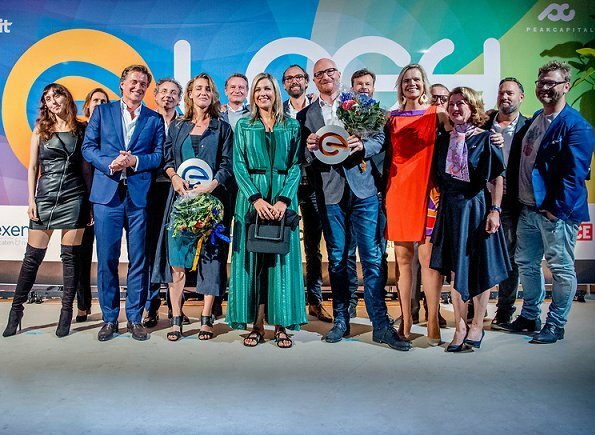 Veel geld te besteden hebben en dan zo'n hobbezak gekocht. Ze predikt verstandig met geld omgaan maar dat geldt niet voor haar zelf. I like the fabric, the colour, even the bodice of the dress, but the length, the huge slit and the lack of lining/underskirt make it very questionable. With the styling Maxima chose (casual hair, low-key accessories and those shoes (those shoes!! ), it does indeed look more like a dressing gown or beach dress rather than an actual dress, let alone one fit for an award ceremony. Good thing these people are in online businesses because none of them seems to know how to dress for the occassion. In the large group shot, one could mistake them for a theatre cast, all dressed in costumes. I love this dress, but Maxima is not wearing it like she should. With those shoes (if I can call them so at all) and hair she's making it look cheap. But among others she looks rather well. Oh my gosh...where did she think she was going? Hospital? Good morning Maxima! I hope you slept well! You mean the lady on the left, who seems to be thinking "All I ever wanted was being a Motörhead-Groupie"? Yes, Pretty Woman, except Julia is prettier, even now so many years after Pretty Woman. 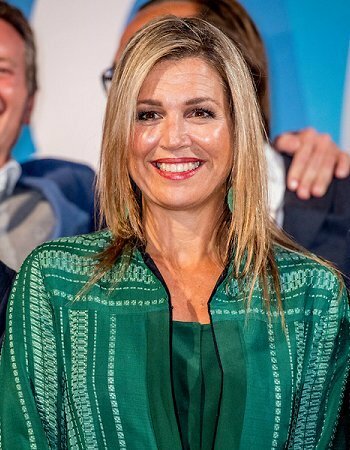 Is there something wrong with Queen Maxima? Did she hurt her legs or something? Why would she wear those sandals on an official engagement? Et en plus il pleut Et Il y'a du vent .La robe fendue jusqu'à la taille vole au vent ! Elle se laisse vraiment aller, a l'air de dire: foutez-moi la paix, tout le monde, je m'habille comme bon me semble. Vaya banda, ufff. La única que se ve bien es la señora de rojo/naranja. I really like the dress, the colour is stunning. The shoes ruin the whole look which is a shame. This looks bad/ Sloppy shoes, bedspread like dress, it's horrible.